LEAWOOD, KS / ACCESSWIRE / September 8, 2017 / CreativeOne, an independent marketing organization that offers diversified financial services including annuities, life insurance and investments, has partnered with the industry-leading networking and communication platform, Succession Link, that connects financial advisors, insurance agents and certified public accountants interested in buying, selling or merging their practices. The valued business succession partnership now gives CreativeOne contracted agents and advisors the ability to use Succession Link at a discounted rate. 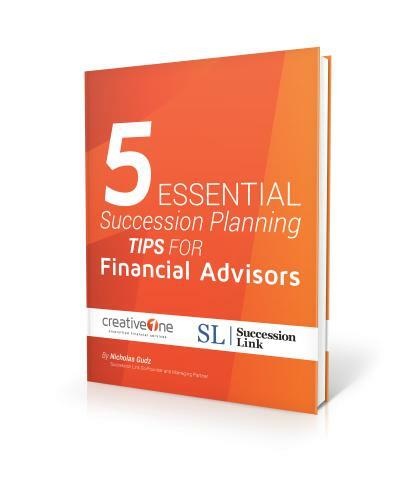 According to CreativeOne's President Mike Miller, "The Succession Link strategic alliance addresses a need top-performing financial advisors and agents have and gives them access to innovative technology with merger and acquisition thought-leadership. It is another example of a CreativeOne advisory-building initiative." Succession Link provides financial advisors, insurance agents and certified public accountants business succession planning options for their own firms. As a privately owned, non-affiliated company, Succession Link offers an extensive listing of more than 21,000 advisory firms, insurance agencies and accounting firms located throughout the U.S., with an average listing having nearly $200M in assets under management. According to Succession Link co-founder and managing director Nicholas Gudz, "The mutually beneficial partnership assists with connecting financial advisors and insurance agents who are looking for the appropriate firm to transact with our state-of-the-art technology platform that sets the stage for desired business expansion opportunities." The partnership will give advisory firms the same amount of planning and attention advisors and agents would to their own clients. With a changing financial-industry landscape, CreativeOne is focusing on being a versatile organization, so their clients can broaden their practice, creating opportunity to enhance their revenue and market share. Succession Link is the largest privately owned online marketplace for financial advisors who want to buy, sell or merge their practices. Members are able to communicate freely with other prospective advisors via its private messaging system. It also offers tools and services that help with evaluation and transaction process. Succession Link was founded by a group of leading financial professionals who have spent their careers working with advisors. Surpassing the traditional definition of an independent marketing organization, CreativeOne is an industry-leading diversified financial services organization focused on retirement income solutions, including annuities, investments and life insurance. Changing the scenery since 1984, CreativeOne has been providing expert advisor solutions that foreshadow regulatory change while supplementing successful independent businesses through exclusive product offerings, trend-setting lead-generation programs, and award-winning marketing services. With more than 140 dedicated employees accommodating thousands of insurance and financial professionals nationwide, CreativeOne is committed to using industry best practices while unifying technology to enhance advisor productivity and deliver top-notch end-consumer solutions. Visit www.creativeone.com for more information. For more information, please visit https://creativeone.com/.